Well, tomorrow is Christmas Eve, which in Sweden is the “main event,” so to speak. This means that I might have time to read Daredevil #11 tomorrow, but I can guarantee I won’t have time to review it until Thursday. Before then, I wanted to make sure I get a Christmas post done. 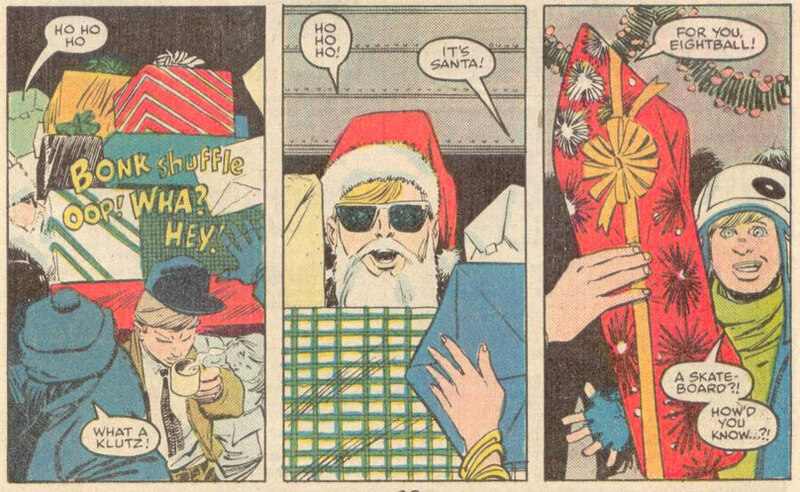 In the past, I’ve talked about Matt Murdock’s Christmas party from hell, aka Daredevil #206. There was also that other time Matt had an even worse Christmas, right after dragging himself out of the river during Born Again. More on that here. For a more recent example of a Christmas issue, we have Daredevil #7 (vol 3) from 2011. As you might expect, this is not exactly a heart-warming tale. Within the first few pages, Nocenti does her best to test your faith in humanity. Daredevil catches The Fat Boys (the kids who used to hang around with Daredevil during this era), trying to make money out of pretending they’re collecting it for a charity. Daredevil then pressures them to give the money to someone dressed as a nun who is running her own con game. Are you depressed yet? We then cut straight to a one-off villain who calls himself the Trixter (his shtick is disguises and illusions…), and who has long had an interest in Daredevil, and wants to draw him out. The Trixter is also apparently suicidal. He goes to a costume store in search of a Daredevil suit, but walks out with a horned skull on his head instead. He matches this with a long white gown and angel wings and puts on a show walking a tightrope at Rockefeller Plaza. Daredevil shows up, picks up on something weird emanating from the Trixter, and they trade words (mostly) and blows (not so much) over a few pages. The Trixter gets away and heads for the Chrysler building. Daredevil follows suit, more philosophizing follows, while the Trixter ties himself to the top of the building where he is electrocuted when lightning strikes. 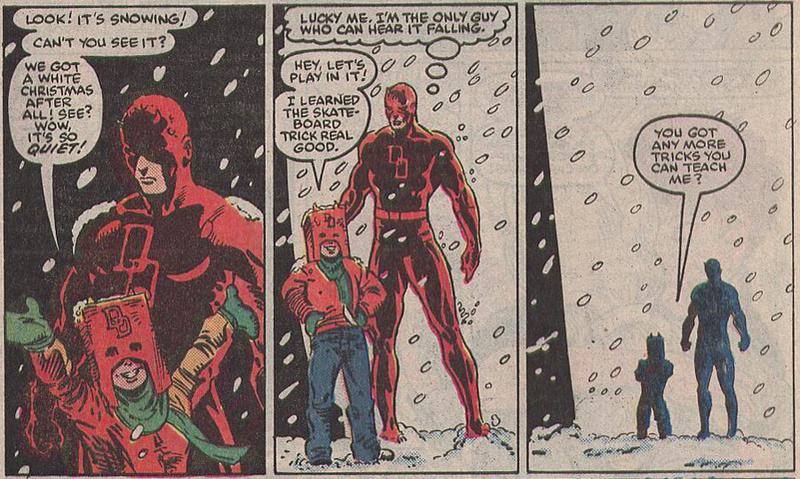 Daredevil berates himself for not being able to save him. Then one of the Fat Boys show up (as seen below). Oh, and Matt has also stood Karen up for Christmas dinner, and completely forgotten about it. Meanwhile, she and her friend Hilda decide to spend Christmas together as planned, even though Hilda has also been stood up and fallen off the wagon (she has a drug addiction). This is a more traditional Christmas tale. At the start of the issue, the relative peace is broken by a group of thugs, referred to as “wild boys” throughout the issue, who drive fast, and rob people and local businesses. While still doing the right thing – in this case help an injured man left in their wake – “Eight Ball” (the leader of the Fat Boys) admires their free-spirited ways and wishes to himself that he could ride with them. Daredevil catches on to this as he arrives on the scene, promising himself to catch up with the Wild Boys later, as there are innocents to tend to first. Daredevil, as Matt, heads over to his legal clinic first, to bring over a Christmas tree and is greeted by lots of grateful people and plenty of food for Christmas. Later that day, he catches the thugs and bring back their loot. The owners of the stores much of it was taken from are so grateful that they let him keep the presents, which he in turn gives to people in need at the legal clinic, where the party is still going on. Much of the issue focuses on a pretty heartwarming subplot involving Eight Ball and Darla, of Fat Boys fame. The two clearly like each other, but Eight Ball is trying to play it cool and keeps picking on Darla. At the end though, he ends up giving her his new skateboard. It is a good deed that Daredevil rewards at the end, by giving him a new one. What about the Kingpin? He’s mentioned in the title of the issue, after all. Well, he never has any direct interaction with Matt this issue, except that he keeps obsessing about him. He’s affected by Matt’s legal work in Hell’s Kitchen though, which threatens to undermine a real estate project that Fisk wants to see realized. His complete lack of sympathy for his henchmen wanting to take time off for Christmas – yes the parallells to Dicken’s Scrooge are obvious – backfires however, when the landlords he wants to buy from resent being pestered on Christmas. I won’t say much about this particular issue since it is fairly well-known and has been covered by numerous other bloggers (see this post, for instance). It is unusual, spooky and then turns into the downright demonic as Matt has his first encounter with Mephisto in the form of an enigmatic woman at a bar where he’s nursing a beer for Christmas. Well, that’s it for now! Happy Holidays! 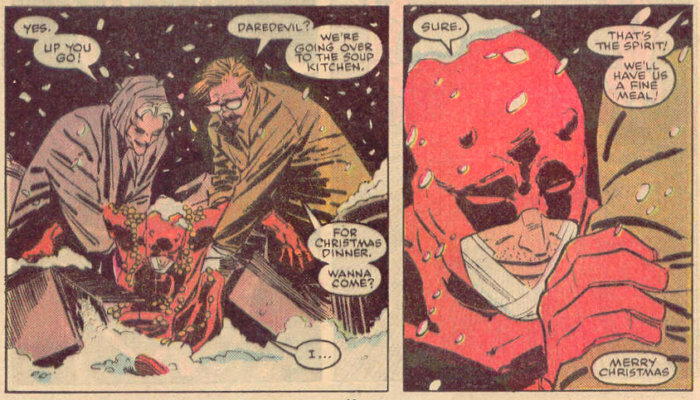 There’s another Nocenti Christmas issue as well – one that I strongly dislike as just being weird (yes, I have no problem with Daredevil making out with Mephisto, but I find this issue weird). Issue 277 – Of Crowns and Horns involves Matt having dinner with a psychologist who has a wife that has very metaphorical visions. In the end, the psychologist realizes he is holding his wife back by treating her as a patient too and the end. Black Christmas is a bit dark, but I like it. It has a lot going for it in a very Ann Nocenti way (as usual, it’s the people of Hell’s Kitchen that stand out rather than Daredevil). I haven’t read Merry Christmas Kingpin, but I’d like to get a hold of a copy just to see the Wildboys too (since they’re involved in the Daredevil beatdown during Typhoid Mary’s appearance). Beer with the Devil is quite cool, though. It’s a good ending of the saga up to that point and sets up the journey to come. It seems Ann Nocenti must love Christmas stories (or find them appropriate for Daredevil) because she has quite a few. From someone who likes to keep track of Daredevil continuity, nothing ages him more than quick Christmas episodes, but it still works when used appropriately. Yes! I remember that story, can’t believe I missed it! It also contains a really disturbing panel of Matt passing a blind beggar on the way to dinner and having really awful thoughts about him. Very disturbing to me. Hello. Thank you for posting a link to my write-up of “A Beer With The Devil.” Your blog on Daredevil is very insightful and informative. Keep up the great work. @Ben Herman: You’re very welcome! @Ellen: Thank you so much! 😀 I read it right away!